We got down to the venue early and out back of Massey Hall is also the backside of a theatre showing a premiere of ONDINE. There was a small crowd waiting to see Colin Farrell & U2’s Bono and Edge. 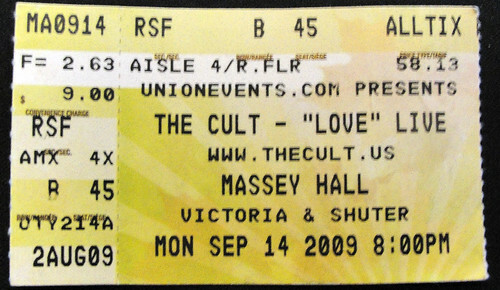 We snagged a brief video of their exit and then headed towards the front doors of Massey Hall for the presentation of the 1985 Album LOVE by THE CULT. We arrive at our seats in row 2 on the right side and I begin to hear security telling the front row that they will not be allowed to go up and approach the stage.? So I asked the person what they said and she told me that security was told that we are not allowed to STAND UP ? Are you kidding me. This is THE CULT. This is rock and roll. The security guard went on to tell us that the new promoter doesn’t want the people behind us to get upset and ask for refunds. He also said it was up to the band. Out walk the band and the entire place stands up and they begin with NIRVANA… the first song off of their album LOVE. As the crowd gently leans into this song and the next few Ian Astbury says ” We’ve got a few more of these songs for you while you get your work done, texting & cell phone bullsh*t… then we’re gonna have a ROCK SHOW!” The crowd answers with a scream… the aisle beside us started to fill up with cell phone photographers and the first free spirit who dropped her purse and started her trance-dance close to the stage. Security moved her back…abit not much. Now…during the last 30 seconds of Brother Wolf, Sister Moon…a handful of music lovers approach the stage and the same security guard appraoches them quickly with his arm to say no… Ian Astbury finishes the song and walk to the edge of the stage and puts his hand on the security guy pushing him aside and calls ALL OF US to the Stage. 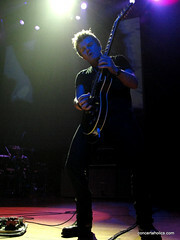 We bolted right up to the edge and hugged a mini monitor in front of Billy Duffy. RAIN started and the place erupted into a Rock Show….”Hot sticky scenes you know what I mean…..” We’re singing it and I am pumping my fist like I’m 16 and at my first concert pressed against the stage… Duffy is 2 feet in front of me, there is clapping, screaming, dancing, guitar solos, energy and now the smell of a concert from the 80’s….the smoke rises past us and over the stage… There were no security guards to be seen now. HOLLOW MAN continues the rock-train…. and up next is REVOLUTION. This is one of those tunes that you can go a decade without hearing because the other Cult songs get the radio play…but the beginning guitar riff has those 2 chords that put me on the bus going to grade 9 with my sony walkman on. We get some war scenes on the big screen and best of all we get everone singing Revolution, Revolution. 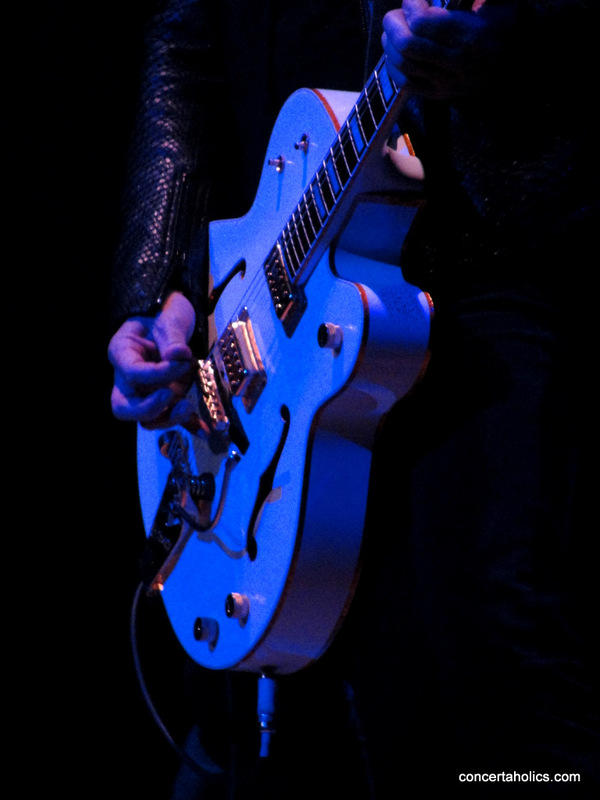 Oh and Billy commanding that GretschWhite Falcon….wow. After that scream-along Ian Astbury introduces BLACK ANGEL as a softer number and we should “act accordingly”…This song has a creative groove and lets us all down softly from the 56 minute rock & roll balloon ride. The band walks off and we catch our breath here with only the video screen showing us images that just won’t register because I’m thinking of the songs to come. The after album set seem to follow the same as the previous nights on this tour…so I believe ELECTRIC OCEAN is first and then WILDFLOWER which features Billy taking his guitar over to the right of where I was to some other fans who had “picks” in their hand and he allowed them to attempt/stroke/play the popular riff for wildflower …which you can see 30 seconds into this iphone live video feed I was doing into my facebook. Poor quality but you get the idea.. and I was back to my kid-like fist pumps on this one too after I put the camera away. DIRTY LITTLE ROCKSTAR (video) comes off real well live with some great bass & drums …being from their 2007 album it is the newest song we get to hear and the crowd loves it …how can’t they. Ian asked if they wanted a rock and roll show and his band was delivering… This song reminds me of the guitar riff in “Under Cover Of The Night” by the Stones. Ian at one point is calling out @strombo ‘s name as in George Stroumboulopoulos of “the Hour”. he continue’s “where are you…you better be out there”…. Another tambourine is airborne in front of the stage, a Rose ends up on the stage and everyone is still on their feet and chanting FIRE WOMAN (video) – The train doesn’t want to slow down… but Ian now mentions that this old place has a curfew… and that this is their last song. This was not the best concert I’ve been to…. where I was the lead singers vocals were low as was the lighting at times on the frontman… I am not compaining about all that great guitar I got thrown in my face….it was epic…. andconcerts are not just measured on the lighting, the sound and the venue… it’s a mix of the above and what happened tonight …and in this final song was one the finest “concert experiences” I’ve been part of. It was the attitude of the band, the rock and roll delivered and the connection with the audience right up until the end of the show. Astbury says “this is for KC and Finnigen” and they Launch…LOVE REMOVAL MACHINE… we all got our groove on one final time and near the end of the tune Astbury signaled a couple people up on stage and as I was video’ing 3-4 people dancing around I decided to join them and jumped up for the final 10 seconds….What a rush.. as I bee-lined for the drummer John Tempesta and said Great Show man… and then proceded to ask for a drumstick. Which you can see at :31 seconds of this video. Score! …all the while I kept the video rolling…. 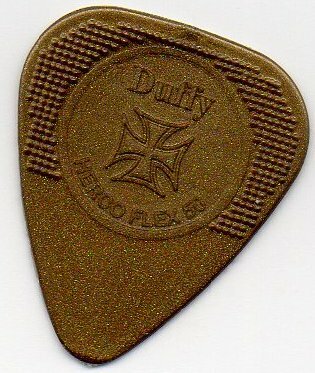 Gave Duffy the Nod as headed off and eventually we got down from the stage…people were helping themselves to guitar pics and setlists. 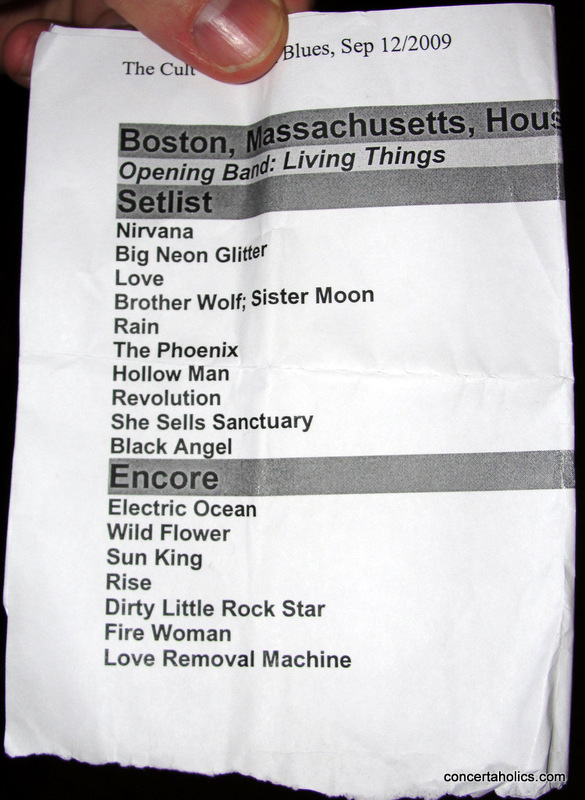 the setlist we got is from Boston. To turn around and look up off this historic stage was quite a finale to this “real rock concert” . 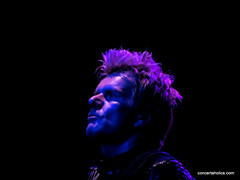 If you were at the show please leave us a comment…down front, onstage or balcony. Let us hear your take. Thanks. This entry was posted on Monday, September 14th, 2009 at 4:48 pm and is filed under The Cult. You can follow any responses to this entry through the RSS 2.0 feed. You can skip to the end and leave a response. Pinging is currently not allowed. very cool site….nice vids too…we were far left stage floor about 6 rows back…but I ended up bouncing around…upper and lower balconies…cool night! Right on Wino… that’s a cool idea too… cruising around the venue. I was pinned to the stage… got lucky with the videos…no major shoulder taps. Thanks for stopp’in by. Thanks for the videos of one of the best rock shows ive witnessed (and there are thousands). Easy to see (hear) why this band is so true and so special. 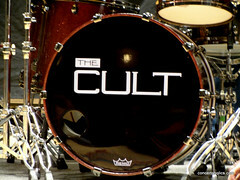 The Cult Fan Club website! Hey my son and I were at the show, My son is Ethan and it is a night he will never forget. Not only did he get to see his first concert and favorite band but got the thrill of his life to actually get up on stage with the band. The moment was priceless and the smile on his face as we left that night can not explain the joy I felt for him. Many thanks to Ian and the band for making a dream a reality for a true fan. @Ralph It was an awesome moment for sure. If you ever need a good copy of the video just know that I have one on file and you can contact me anytime.